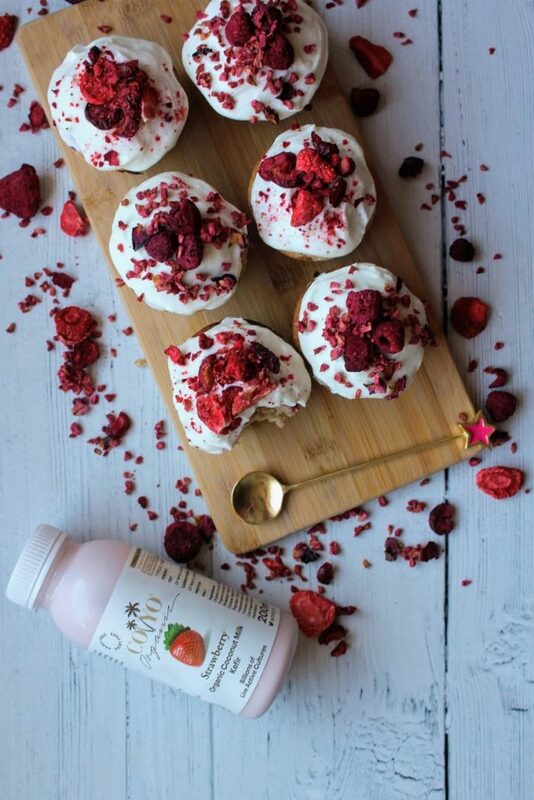 The guys at CoYo have developed an organic dairy-free kefir made using traditional age old methods by fermenting their coconut milk with live, vegan kefir cultures to produce a rich drink brimming with billions of live active cultures. Sound good? If you’re a fan of their wonderful yogurts and ice creams, this recent addition is sure to be a hit, especially for those of you who conscious about gut health! 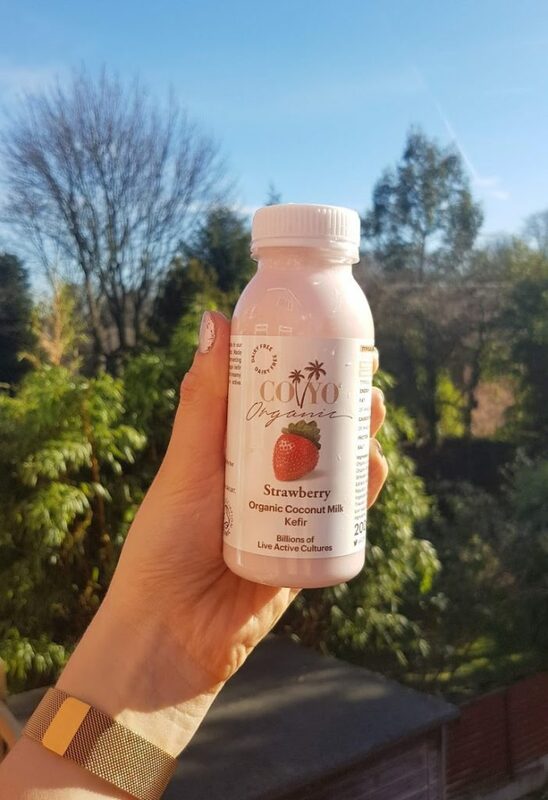 Available in Natural and Strawberry flavours, I am in love with the thick and creamy silky smooth texture, non-acidic and not-too-sweet flavour, plus it makes a refreshing drink on a sunny day! I don’t really drink creamy things so I found I was full after drinking half the bottle and saved it for the next day – and of course I used some in a recipe, surprise surprise! 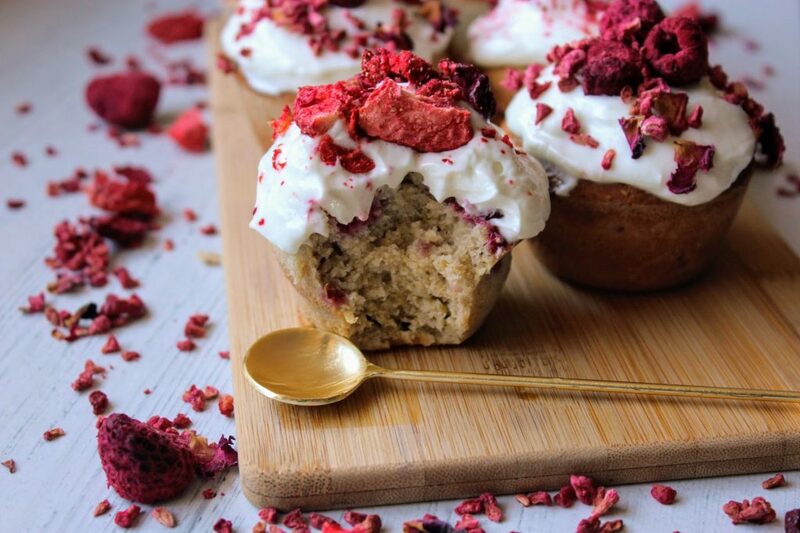 With Mother’s Day coming up, I made some muffins which would be ideal to celebrate the occasion – easy to make, pretty and delicious plus they are vegan-friendly, dairy-free, gluten-free and contain no refined sugar, so a winner all round! 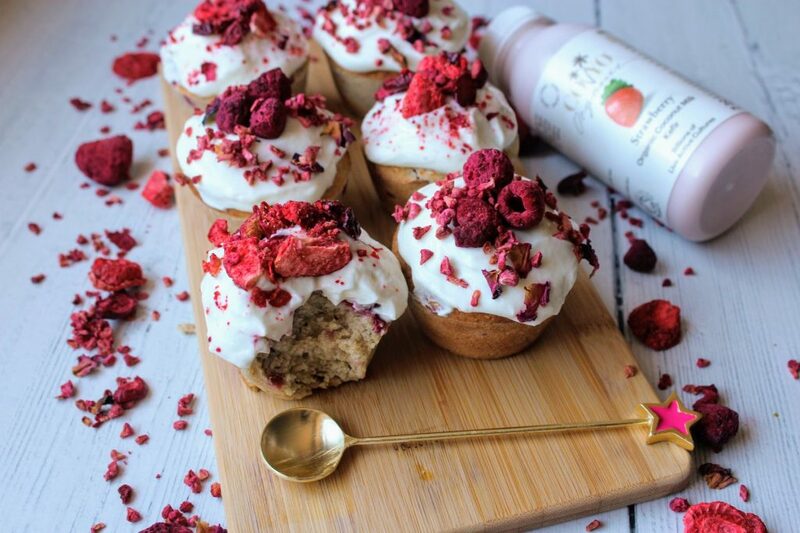 The coconut kefir drinks make a great addition to the batter as well as being thick enough for the topping. First make the muffins: Preheat the oven to 180 degrees C and lightly grease a 6-hole muffin tin. Mix together the flours, coconut sugar and baking powder in a bowl. 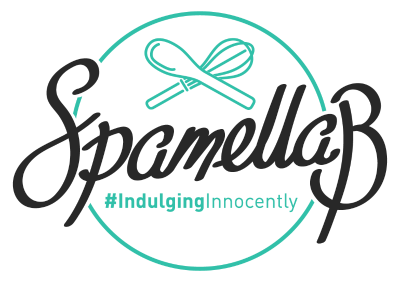 Stir the flaxseed and water in a bowl and leave to stand for 5 minutes to thicken. Then whisk in the apple puree, oat milk, maple syrup and vanilla extract and pour into the dry ingredients. 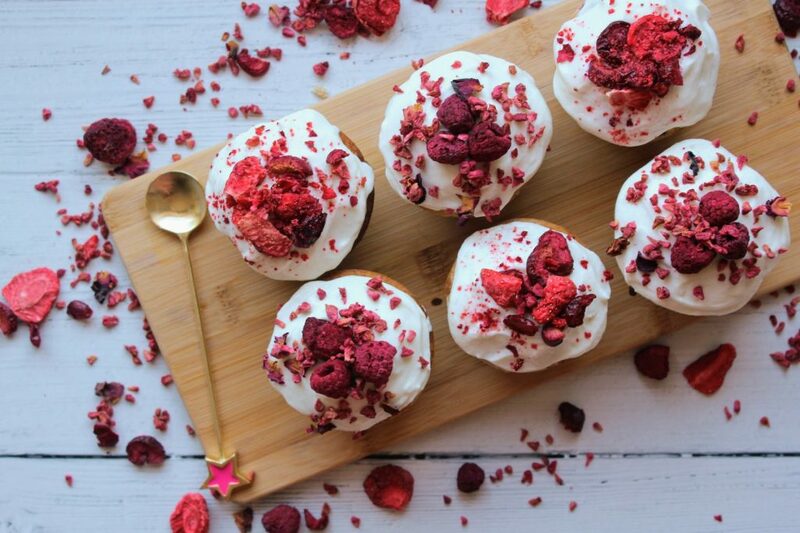 Mix well and fold in the raspberries. Spoon the mixture between the muffin tins and bake for 20 minutes until risen and golden. Leave to cool then pop onto a wire rack. Meanwhile beat together the coconut yogurt, maple syrup and vanilla and keep chilled until needed. 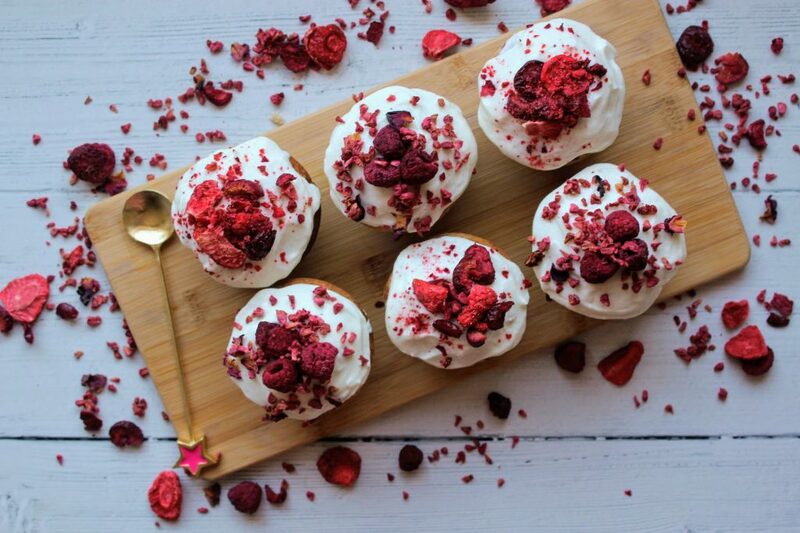 Once the muffins have cooled, spread each one with some yogurt and sprinkle over freeze-dried berries. Enjoy!